Description: Shankar and Birju grew up on the footpath together like orphans. They knew only the principle of friendship. They both met Pammi , who was in the clutches of a ruthless man, called Jumbo. All three of them looted a marriage Procession, planned by Jumbo. Birju's greed resulted in getting Shankar caught by the police. Pammi was hiding from Jumbo's wrath and also the police, while Birju was living a lavish life. Shanker comes to know through Pammi about the whole episode and he decides to take revenge.While in jail Shankar learns of the presence of diamonds lying in the vicinity of Kala Parbat. On his release from prison, he and Birju start their journey to Kala Parbat. On the way Shankar beats up Birju and leaves him in a desolated place, and proceeds to Kala Parbat. The exact location where the diamonds were buried was known only to dumb child. The dacoits use to threaten the village people because of these diamonds.Shanker reaches the village where his human feelings came to the force. And Birju also escaping death reaches the same village. The tussle between Shankar, Birju and the dacoits started. 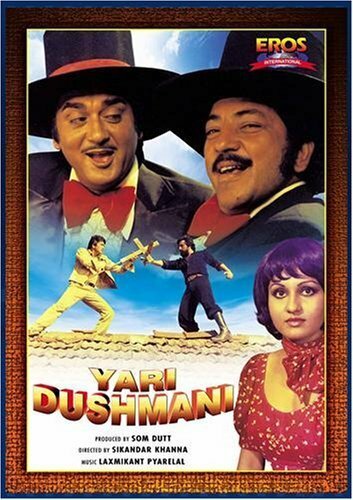 And what was the outcome watch out in Yari Dushmani.Shankar and Birju grew up on the footpath together like orphans. They knew only the principle of friendship. They both met Pammi , who was in the clutches of a ruthless man, called Jumbo. All three of them looted a marriage Procession, planned by Jumbo. Birju's greed resulted in getting Shankar caught by the police. Pammi was hiding from Jumbo's wrath and also the police, while Birju was living a lavish life. Shanker comes to know through Pammi about the whole episode and he decides to take revenge.While in jail Shankar learns of the presence of diamonds lying in the vicinity of Kala Parbat. On his release from prison, he and Birju start their journey to Kala Parbat. On the way Shankar beats up Birju and leaves him in a desolated place, and proceeds to Kala Parbat. The exact location where the diamonds were buried was known only to dumb child. The dacoits use to threaten the village people because of these diamonds.Shanker reaches the village where his human feelings came to the force. And Birju also escaping death reaches the same village. The tussle between Shankar, Birju and the dacoits started. And what was the outcome watch out in Yari Dushmani.